How does this novel compare to other low-metal SF worlds, such as in Vernor Vinge’s Tatja Grimm stories? Thank you Mr. Williamson for your service. I/m looking forward to reading his book. I can’t remember the last time one of the Big Ideas peaked my interest, but this one did. Steven: I’m not sure. I haven’t read the Vinge ones. I have some de Camp Viagens stories here, and I haven’t read them, either. I became aware of both after the fact. I plan to look at them, of course. This is an excellent book. Williamson manages to get down to the nitty-gritty of how a working “technolithic” civilization would work, and the sorts of difficulties they’d face with the materials limitations they’d have to deal with. At the same time, the tech never interferes with the story, which has a lot to do with just WHO the “primitives” are in this situation. There are a lot of delightful surprises and a very satisfying resolution. I won’t give you any spoilers. This is a well worth re-reading book, but the first time should be filled with the enjoyable surprises. Geeks such as myself are going to have a lot of fun time trying to pick Williamson’s tech tree for the aliens apart. Everybody else plus geeks can enjoy a rollicking good story. Any gratuitous insults towards currently-existing Democratic groups this time around, as in “The Weapon”? This definitely gets added to my list of books to buy. One of my recurrent complaints about much SF is that when find inhabited planets, too often, they’re populated by some monolithic race/culture/government…and that’s always irked me. I’m looking forward to seeing what happens in a book that purposely turns those ideas on their heads. As a side note, I emailed Michael when I had quibbles about something in one of his previous books and I got a well-considered reply from him in response, (actually a few emails back and forth). He didn’t convince me that his mindset was necessarily the right one, but there’s no question that he’s a mensch. I recently discovered Williamson’s books a couple weeks ago at Uncle Hugo’s. While I thought “Freehold” was very good (reminds me somewhat of Heinlein’s “The Moon is a Harsh Mistress”, lots of philosophical stuff with the action kicking in later), I really loved “The Weapon”. I am currently half way through Contact with Chaos and am not disappointed. In my opinion, if you enjoyed Heinlein, you will enjoy Williamson. Richard: There were a LOT more gratuitous insults in Better to Beg Forgiveness… and I’m writing a sequel to that now. It may not have as much political sniping, but it will have the action and sarcasm. @Richard: I rather enjoyed the gratuitous insults…. In the interests of fairness, it’s the capitalists who get a roasting this time. But where do the Skeksis come into it? Or is that another case of the cover artist reading two paragraphs then running with whatever they were wanting to do anyway? I LOVED The Hero and must read this one. @dkritz: It severely compromised The Weapon for me. @Richard: The future Earth in that universe is fascist, not socialist. I may not have given enough backstory yet, because a lot of readers haven’t picked up on that. Of course, statists of all types have some common attitudes. @James: Kurt had to do the art before I was finished–I ran late–and he had only a partial MSS to work from. The Ishkul should be flatter faced, and not quite so gatorlike. It’s a striking cover, though. His covers usually are striking. The gator attributes could be from illustrating too many Posleen. You have to admit it resembles a Dark Crystal sequel though. How did you work out the problem for a low-metal civilization developing electronics and computers? In my ignorance, it would seem that without metal, it would be difficult to develop any coherent theory of Electro-Magnetism? I’m curious for your response — I was intrigued by the concept presented here! After many moons of Big Ideas I could happily pass over things like this come along forcing me to spend money again! Looks good – and I liked everything else I’ve read so……. Dude! That is totally a Protoss on the book cover. It looks more like a Kif to me. And I think Beads and Trinkets is a great title. Heinlein always had political sniping at politically current groups and movements in his writing. It is hard to recognize now because those groups and movements are ancient history now. Now before Mad Mike gets too much of a swelled head, no, I am not comparing you to RAH. Just as a note for you guys who haven’t read any of his work, there is one book of his, Freehold, in the Baen free library, as well as a few video interviews done by a mil blog. I haven’t read any of them yet, though I have several in the pile from various webscriptions I’ve bought, but they certainly sound interesting. Josh: They don’t have electrical power. They do have steam and hydraulic. Though it is possible to use mineral salts to generate DC, and even make a liquid core for radio reception. I don’t know enough for the details. I agree with Nick@20; Beads and Trinkets is a great title. A great story for all aspiring writers to keep in mind when they “just don’t feel up to writing.” Hope you don’t mind if I pass it along. I’ll have to buy the book because I’m not sure I understand how this works. If you eliminate all metals from the surface environment, how does the biochemistry work? Eliminating iron and copper (and presumably magnesium) eliminates hemoglobin, hemocyanin (copper based blood in most molluscs) and chlorophyll as options for oxygen/CO2 transport. Or perhaps the ban on metals enforced by culture as much as by environment? I’ll look for this novel; sounds good. My first encounter with this idea was in the excellent C. M. Kornbluth novella “That Share of Glory,” much of which takes place on a world with metal-free technology (into which metals have just been surreptitiously introduced, we learn at the end). Bozo: As was noted above, the only metals that are relevant are the ones that can fabricate tools. All the light metals require either electricity, or high temp/pressure/catalytic chemistry to refine. Bronze and iron are the keys. Most iron on Earth is from meteoric sources. The heavier metals (including copper) are quite rare. They’re also rather reactive. An acidic environment breaks them down into oxides fast, and if you don’t know what to look for, then you don’t develop them–consider that the Ojibwa and Iroquois sat on top of the Lake Superior Hematite and coal for centuries and never put the two together. If you have good chemical and hydraulic technology, metal is somewhat secondary, and if you’ve never used it, it’s not something you go looking for. FrancisT @ 24: Well-written review. Helped clear some things about the book up for me. I think I just may go out and get the book. When I think of it, many forms of technology are possible without metals. Early computers used vacuum tubes; the electricity could indeed come from a chemical source. I wonder if many of the discoveries in quantum dynamics and such would be possible without metal? The photoelectric effect, for example: it wouldn’t be any more or less difficult to explain without metals (would it? ), and the revolution that discovery kicked off had major impact. I’m reminded of a short story (dammit, can’t remember the name or the author – Arthur C. Clarke comes to mind, but I’m unsure) about how the physics for FTL/Antigravity were quite simple, so many races discovered it, with humanity, due to a fluke, being the exception. As a result, humans advanced much more in other areas, while FTL-aware races, having reached their percieved pinnacle of science, used technology reminiscent of the 18-19th century. When the aliens paid late 20th century humans a visit, instead of being the subjugators, they ended up being the subjugated. Looks like a book I *have* to read! Thanks for your service, Michael! Josh E @30 – The last book you mentioned sounds very interesting. If you happen to remember the name, let me know! I’ll dig around my library this evening and see if I can find the story – it’s a great short piece. The only real specifics that I remember is that the aliens were playing the conquistador card, and were described as vaguely ursinoid. In their starships, they used some captured animal as an air scrubber, with bioluminescent animals as internal lights. Their weapons were, of course, cannons of the cannon-ball variety and muskets of the well, musket-ball variety. They landed on the UCLA campus, checking the environment with canaries first. Anyone else twigging to which story I’m referring to? You are looking for “The Road not Taken” by Harry Turtledove. It is chapeter 22 in “3xT” which can be found at http://www.webscription.net//p-422-3xt.aspx or at probably any reputable bookstore. I remember first reading it in Analog, but I couldn’t tell you which issue to look for. I finished reading this one about a week or so ago, and I highly recommend it to anyone. If you’re familiar with Mike’s military SF novels (like Freehold and The Weapon) or his present day military thrillers (The Scope of Justice series), I’ll tell you right away that it’s different — but it’s the GOOD kind of different. And yes, there is definitely enough action (IMHO) mixed in between the political intrigues to keep any SF action buff happy — it is Michael Z. Williamson after all. And if you’re new to Mike’s writing — this is a really good place to start. Both gold and platinum are low-reactive and excellent electrical conductors, not at the level of silver or copper but good. Most modern electronics use semi-conductors, glass with patterned impurities. The original Franklin experiments used things like cats fur and string, think kite. Getting from the Franklin experiments to the Pentium would involve steps I wouldn’t want to think about, much less try to write about. I can’t tell from the entry and posts if iron and silver are unknown or simply rare. Napaleon had a table service of aluminium because of its rarity and expense. Never read any by Williamson but will be checking out the Baen library and if I like it buying some. I had this open on my desk when the post went up; I’m not quite done – page 299 of 325 – but close enough. Freehold I rate as superb. The Weapon is more disturbing but also excellent. I don’t think that Contact with Chaos is at the same level (and I hate the title, but that’s a minor thing); on the other hand, the characterisation is excellent (for the most part – Margov seems a little 2D) and I did enjoy the alternate tech tree stuff. On the gripping hand, having to write whilst in a war zone is a good excuse! Yup. Though I really ought to be able to just tell by the cover art and font. 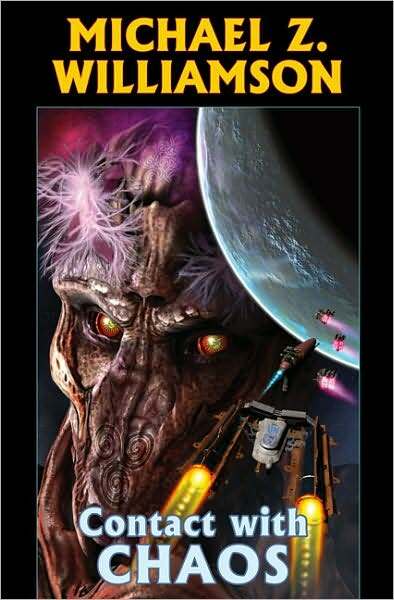 Predictable is nice, and makes sense market wise, but god, Baen’s art department bores the heck out of me some times. b) Freehold is available in the Baen FREE library anyway so why not read it? NTSC @37. Gold platinum tend to be brought to the (near) surface due to volcanic activites and meteor strikes. The planet doesn’t have much of either hence little or no near surface deposits. The point is that on earth copper and tin (and gold and silver) were fairly easily found at first in surface deposits in raw form. Only once those surface deposits were exhausted did people start looking for these metals elsewhere. If you have a civilization that develops without these metals over a millenium or ten then even if someone develops the chemistry to extract these and other metals from their ores they will tend to become more of a curiousity than something of use. Its rather like the steam engine that some greek developed in Alexandria – pointless beyond being a curiousity when you’ve got plenty of slaves and no real need for pumping deep mines. These metals would remain a curiosity only until some engineer saw something using them or a Franklin discovered a use for them. Uranium wasn’t that useful until some time in the 1930s, would need to reread Fermi’s biography to get a firmer date. Cesium and Rhubidium were so useless that they were given to Fermi when he went looking for them for some experiments. You can build a NAND gate using fluidic logic and I think I’ve seen it using air as the fluid, so computers wouldn’t be impossible without electronics. Fluid logic was used in places that you could not risk sparks, I became aware of it in about 72. @ntsc: Or use abaci and slide rules, which are much simpler to make, and as effective. @FrancisT: thank you. I’m reading the sample chapters, for now it seems nice. I think I’ll buy it to see how it ends. I have read all your books and thought that The Weapon and Freehold were as good as anything I have ever read. I was less impressed with some of your other books, though I continue to enjoy anything that takes place in your ‘Freehold’ universe. Is there any chance of a sequel for the weapon or a book with Chinran (father and/or daughter) as the main character? Finished CwC last night after several weeks of reading in snatches. I admit I’ve never read any of Williamson’s previous books (something that is getting rectified immediately!) yet was able to enjoy and understand the Freehold universe, their politics, and societies. Should a sequel come about, I’ll be among the first in line to get it.